I obtained my bachelor degree in Animal Biology in the Biology School, Faculty of Exact Sciences and Technology at the University of Panama, and a Master of Science in Primate Conservation in the School of Social Sciences and Law, Anthropology Department, Oxford Brookes University at United Kingdom. I am currently PhD student of Evolutionary Anthropology at Durham University, United Kingdom. I have participated in several research projects including insects, birds and the study of non-volant and volant mammals, specifically in topics related with the biodiversity, taxonomy, population ecology, capture, telemetry, foot print tracking, conservation and animal behavior. I had worked with different projects as research assistant, fellowship, intern, or principal researcher. I had developed a my knowledge based in all my work experience in different Panamanian and alien organizations, as the Panama Environmental Authority, Vertebrate Museum of the University of Panama, University of Panama, Gorgas Commemorative Institute, Peregrine Fund Panama, Smithsonian Tropical Research Institute, British Broadcasting Corporation, Smithsonian Magazine, Granada Film, University of Florida, Florida Museum of Natural History between others. 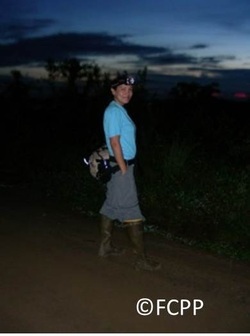 I had served as instructor of tracking mammals in the wild for the University of Panama, and for the Smithsonian Institute, as well as volunteer instructor in different activities carry out by the School of Biology at the University of Panama, and for the I had participated as profesional natural guide and environmental educator for the BarroColoradoIsland visitor program and the educational program of Peregrine Fund Panama, where I contributed as first author for an education al guide. I am founder and co-founder of students and professional scientific groups at the University of Panama such as the Group of Mountain Activities of the University of Panama (GAMUP), the Group of Biology Activities (AGAB), the Mammal Society of Panama (SOMASPA) and recently the FCPP. My interest and dedication for the Panamanian Primates was personal initiative. After work like field assistant in two howler monkeys projects at Coiba Island and Barro Colorado Island, Panama, I realize how poor were the knowledge about our Primates. 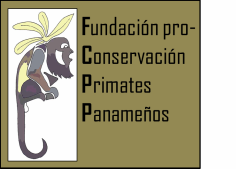 Thus, I started a voluntary project by my self, with the unique objective to generate basic information that will help to the creation of an urgent conservation plan to protect the more endangered Primates subspecies and poorly known in Panama. Actually, this project has reach the 15 years of effort, gained adherents, participated in conferences at international and national levels, and recently awarded the first place as conservation program in Panama by the Ford Motor Company. My interest in the Primatology is to obtain the basic information able to understand the conservation status of each of our 13 subspecies of monkeys that Panama possesses, also, the practice of new methods to better calculate the actual population and conservation of the Neotropical Primates in that are living out to the natural reserves. I have a bachelor’s degree in Biology from the University of Puerto Rico, obtained a Masters in School of Forest Resources and Conservation Program of Fisheries and Aquatic Sciences in UF, and studying her PhD of School on Natural Resources and Environment from the University of Florida. I consider myself a tropical ecologist with a great appreciation for watching the development and changes in nature. 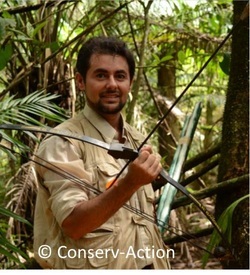 I developed my career as a community forest ecologist interested in forest successional processes, in community based forest restoration, conservation and management in tropical America. In Puerto Rico, I worked for at least ten years in different projects related to plant biology, forest ecology and aquatic ecosystems. I have a curious mind; thus, I expanded the scope of my research activities and worked in different ecosystems, including coral reefs, mangroves, subtropical dry forest, subtropical moist forest and in tropical wet forest in Puerto Rico, Costa Rica, and Panama. I participated in projects that cover population dynamics of single species, to community restoration and vegetation response to large-scale disturbances. My work experiences were at the University of Puerto Rico, governmental and non-governmental institutions as an undergraduate research assistant, a graduate research assistant, an ecologist for a consulting company, teaching assistant, and a biology technician. I have also had experiences teaching undergraduate laboratory / field courses in Botany and General Biology. I am currently enrolled in the Program of Fisheries and Aquatic Sciences of the University of Florida where I used to study the effects of a swamp forest fire on the trophic parameters of an outstanding Florida waters (Little Santa Fe Lake, Alachua County). I want to understand better how large scale catastrophic events such as fire interact with different water quality attributes and how this interaction can affect the eutrophic state of a lake. I like to do mostly outdoors activities such as hiking, snorkelling, among others. I also like to travel, especially to the tropical areas. I think the diversity of organisms that the tropical ecosystems can sustain is fascinating. From my different trips to a variety of develop and undeveloped countries, I have learned about the differences in culture, politic, economy and idiosyncrasies of every place. The social, economic and political reality of every country plays a central role in the conservation and management of their natural resources. I obtained my bachelor's degree in Engineering in Watershed Management and Environment in the Faculty of Agricultural Sciences, University of Panama, and Magister in wildlife areas and Nature Conservation in the Faculty of Forest Sciences and Nature Conservation, University of Chile. I am currently Assistant Professor of the Department of Soil and waters of the Faculty of Agricultural Sciences, University of Panama, in the areas of forestry and agroforestry; in addition i am Sub-Coordinator of Reforesting Centroamerica in Panama where used tree planting activities and enrichment of forests as tools for environmental education to train young people in the importance of the native forest and its protection. I have participated in initiatives related to the promotion of the participation of youth in environmental activities as Tunza program-GEO for Youth in the Sub-region and the Mesoamerican Caribbean Spanish Speaking, Editorial Team of the GEO Youth Report Panama 2010, both initiatives of the United Nations Environment Program (UNEP); in addition to projects of youth empowerment as "Integrate: Forming Central American", directed by the Association for Central American Integration and the Dominican Republic (PROICA-RD). My interest in the conservation of primates is born as a response to the problems of change in land use, forest to agricultural areas dominated by monoculture and the increasing pressure of real estate projects in areas adjacent to wilderness areas in the province of Chiriqui. I am interested in the pursuit and implementation of alternative agricultural production to transform agricultural areas in a less hostile to non-human primates and biodiversity in general, and the popular education of young people and agricultural producers in the conservation of nature. I got a degree in Biology (2010) and the Master's Degree in Biology with a specialization in plant biology (2013), in the Autonomous University of Chiriqui, Panama. My main line of research is biodiversity and the sustainable use of biodiversity. Currently I am a research associated with the Herbarium of the Universidad Autónoma de Chiriqui. My interest in the conservation of the primates, arises due to the gradual loss and fragmentation of forests, a situation that has a crucial role on the distribution, abundance and persistence of species that live in these environments. In particular on species with conservation status critical and endemic. My goal is to estimate the current distribution of the squirrel monkey (Saimiri oerstedii oerstedii) in the province of Chiriqui and generate information necessary for designing strategies for the conservation of this species.